Part I - Power Systems, Solar energy is free but the equipment needed to collect it is expensive. You can think of our bus as a home on wheels with many parallels to a conventional stick dwelling. For example we have a circuit breaker panel, lights, outlets, switches and a host of other things just like what you'd expect to find in a conventional home. A few other things like DC systems, solar panels and a diesel generator are somewhat less common in fixed dwellings but exist in the bus. Additionally, things in the bus that seem similar to those items found in houses can function quite differently behind the scenes. This page takes a detailed look at the electrical systems in the bus and explains their operation. At times it gets a bit technical. Every effort has been made to explain things in plain English so as to reach the widest possible audience. I hope you find the information contained herein informative and enjoyable. We procured the bus in August of 2007 well before the inception of the Bus-Stead Tour which launched in September of 2008. During that time we climbed a somewhat steep learning curve to get familiar with the electrical systems. Additions, enhancements and upgrades were performed to bring the coach up to the level of functionality we anticipated we'd need during our travels. One major upgrade was the installation of a 1,360 watt solar system which would allow us to generate electricity should we find ourselves in remote areas. Should anyone reading this be contemplating solar electricity you may find what's presented here on solar interesting. The design and installation of our solar system was a considerable effort and one of the largest you'll find on any coach. Other than the solar system, the bus's electrical systems are pretty much stock. I say pretty much stock because the battery bank was upgraded and so was the inverter. The diagram at right depicts the bus's major electrical system components. This is a high level overview so much of the nuts and bolts details have been omitted for clarity. Unlike a house, the bus has 120VAC (yellow lines) and 12VDC (black lines) systems working together to satisfy all of its electrical devices. You might think of the bus as being part house and part car. Let's go through the diagram at right in logical parts at a high level first. We can then examine those parts and subsystems in greater detail later on in the presentation. SOLAR PANELS - On the top of the bus (picture at left) are the roof mounted solar panels consisting of banks A and B with 4 170W PV panels in each bank. The overall size of the system is expressed as 170W X 8 = 1,360W. 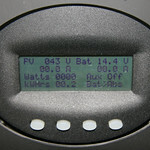 Each bank feeds its own solar controller and the outputs of the solar controllers then feed the battery bank. The idea is to use electricity created by the solar panels to replenish the battery bank. It's a little more complicated than this and we'll get into that later. SOLAR CONTROLLER - A solar controller (picture at left) or charge controller is an electronic device that interfaces, converts and manages the electricity collected by a solar panel bank. The controller is required because the voltages and currents produced by solar panels aren't directly compatible with standard battery banks. 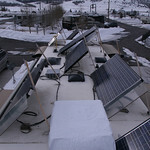 Both our solar banks produce 40 VDC but need to charge 12VDC batteries. The contoller handles this. Solar panel output ebbs and flows according to sunshine levels and temperature. This constantly changing power source requires monitoring and regulation which is handled by the controller. Our controllers are rated for a maximum output current of 60 amps each. For a 12VDC system this is 720 watts. Two are required since our solar panels can collect 1,360 watts during times of peak sunshine. The controllers regulate incoming power and properly apply the required charging cycles to the battery bank. They also track current power, total daily power and keep a collection history for the past 60 days. The controllers also prevent dangerous over charging of the battery bank. They also establish the proper operating point of the solar panels to ensure maximum power transfer. More details on this later. BATTERY BANKS - The bus has two separate battery banks named "house" and "chassis". The house battery bank consists of 4 8D deep cycle AGM 12VDC batteries connected in parallel. This bank primarily supplies power to all the DC loads associated with the living space. The chassis battery bank is like your car battery and provides cranking power to the starter motor and engine/chassis related loads. Two group 31 AGM 12VDC batteries are connected in parallel to form the chassis bank. 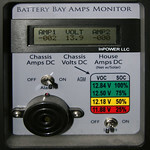 I made a battery bay amps monitor (picture at left) to keep tabs on net current flow for each bank. An echo charger is used to steal away a small portion of the house bank's charging current to keep the chassis bank "topped off". This avoids dead batteries when you go to start the engine after an extended stay. It isn't uncommon for the bus to remain parked for up to 6 months if not longer. Good quality deep cycle batteries can be put through a charge/discharge cycle about 450 times before they begin to lose their capacity to hold a charge. If you cycle them every day this means they will last about 1-1/2 years. SHORE POWER - This is a marine term taken from dock mounted AC receptacles used to provide power to boats when docked near shore. RV parks and resorts providing hook-ups all have "shore power" near your parking space. Like its boating counterpart, it provides AC power you just plug into while parked (or docked). The better parks will provide 20A, 30A and 50A service in three different outlet connections. Our bus can use 20A or 30A service if 50A isn't available. If we run air conditioners or electric heaters then a 50A connection is required. Hooking up means unwinding a heavy shore power cord and plugging it into the service panel. 50A service is actually 2 120VAC 50A circuits otherwise known as 2 phase with a common neutral leg. It actually provides a total of 100 amps. The shore power feeds directly into a surge protector and bad power detector. If the neutral leg of the 50A service is compromised it can cause 240 VAC to be accidentally applied to 120VAC loads. Within an instant thousands of dollars of damage can result. The protector examines the power first then connects it through if everything is okay. Surges and power spikes are also suppressed. Clean power is then fed to the transfer switch which allows switching between shore power or the diesel generator. If the diesel generator isn't running the switch automatically defaults to shore power. AC power (diesel or shore) is fed to the main circuit breaker panel for distribution to all the AC house loads. DIESEL GENERATOR - Boondocking which is slang for dry camping refers to holding up in remote areas that lack services. Our bus has an onboard 8KW 3 cylinder diesel generator which can provide power in remote areas. It is designed to run quietly and produces enough electricity to cover all our power requirements to include air conditioners, washer/dryer, microwave oven, etc. The transfer switch will automatically connect the diesel generator's output to the breaker panel once it starts. A manual starter switch is located inside the coach and cranking power comes from the chassis battery bank. The generator will also start automatically when commanded by the generator start module whose function is explained in the inverter section. Generating electricity via diesel is the most expensive way to produce power. At reduced load the genset will burn 4/10 gallons per hour and at full load it burns 9/10 gallons per hour. If diesel fuel is $3/gal you can expect your in house power plant to run between $1.20 to $2.70 per hour. And that doesn't include the cost of the genset, normal wear, service, etc. Taking an average of the fuel costs and assuming you run it for one month you'd rack up a $1,404 electric bill. The generator needs to be sized to cover peak loads and even though you aren't using that extra capacity you pay for it anyway during the times when demands are below peak. But this is extreme and the genset typically isn't used this way. A more normal usage is to run it for short periods of time to cover high demand loads like a washer/dryer, hair dryer, microwave oven or recharge your house batteries. Supplementing your electricity needs with solar and using power wisely means you could reduce genset time to an average of about 1 hour per day. This also assumes you are in a climate that doesn't require air conditioning. Regardless of how you use power, generating it via diesel and solar is more expensive than purchasing it from the power company. But if you find yourself in areas that don't have commercial power available you either generate it yourself or sit in the dark. INVERTER - An inverter is an electronic device that produces 120VAC (normal house current) from a DC source. That DC source can be a battery bank, solar panels or a combination of the two. Inverters can give us limited AC power when utility power isn't available or convenient. Cars, trucks and busses equipped with an inverter put limited AC power on the road and it's handy to have in those remote areas. The already present 12 or 24 volt DC system in a vehicle is used to power the inverter. Inverters can range from 120W cigarette lighter models all the way up to 3000W industrial duty units. Inverters are sized in watts by the power requirements expected from them. An inverter rated for 120 watts could run two 60 watt light bulbs. Larger units in the 2400 to 3000 watt range will run a hair dryer or power tools. Cheaper inverters will only approximate utility power which is usually good enough for lights, chargers, power tools and hair dryers. These units produce power that is called a square wave or modified square wave. You'll pay more for an inverter that has a greater power output. Within a given power rating you'll pay more for how faithfully the inverter will reproduce utility grade power. Pure sine wave inverters with crystal controlled frequency will produce an exact replica of utility power. Microwave ovens and some electronic equipment require true utility power. If you are powering these devices you'll need a true sine wave inverter. These are the most expensive units in the inverter famliy. Higher capacity inverters designed for coach service are available with a built in battery bank charger. It is convenient and saves space when the inverter and charger functions are combined in one unit. When utility power is available the inverter/charger switches to "charge" mode and begins charging the battery bank. During charging, the inverter function is turned off and utility power is patched through to the inverter's AC output terminals. Good quality inverter/chargers have smart charging algorithms to include temperature compensation and multi-stage charging cycles. All these features help charge your battery bank efficiently and prolong its life. Some inverters designed for coach service offer an automatic generator start module that monitors battery voltage and inside air temperature. If battery voltage falls too low it starts the generator and begins a charging cycle. If inside air temperature climbs too high it starts the generator to run air conditioning units. We upgraded our inverter to a pure sine wave unit capable of 2800 watts. It includes an automatic generator start module as well. The inverter's output is fed to the breaker panel's inverter load sub panel. Driver side outlets, passenger side outlets, microwave oven and entertainment systems are powered from this sub panel. When shore power is available the inverter goes into charge mode and floats the house batteries. A remote display panel mounted in the living space allows complete control and monitoring of all inverter/charger functions. If the battery bank needs charging the inverter/charger handles this by providing a timed multi-stage temperature compensated charge cycle. When charging is completed it returns to float. Float provides a small charging current up and beyond the house loads that keeps the battery bank topped off for an indefinite period of time. CIRCUIT BREAKERS - The circuit breaker panel is almost like that found in a conventional home. The difference lies in the addition of an inverter sub panel which isn't found on a home unit. A shore or diesel AC power feed comes into the circuit breaker panel and is then distributed out as individual 15 and 20 amp circuits. Given we have 50A service the panel is divided into line 1 and line 2 each 50 amps. Typical loads are dedicated outlets, washer, dryer, oven, air conditioners, charger, etc. The inverter's AC output is routed through a separate sub panel which feeds convenience outlets, microwave oven and entertainment electronics. The total load is limited to 2800 watts which is the inverter's maximum power output. Standard circuit breakers protect from over loads. Like in home panels, breakers trip when their current capacity is exceeded. When running on 20A or 30A service the panel provides current monitoring and automatic load shut down of loads beyond available power. This prevents accidentally tripping a shore power breaker that can't be reset. ALTERNATOR - The diesel engine has a 200A alternator mounted which functions just like the alternator in your car. When the engine runs the alternator generates power to recharge the chassis batteries and to power chassis loads. 200 amps provides plenty of additional capacity which can run the inverter and allow AC during travelling. Both house and chassis batteries charge through the alternator while driving. Owing to historical trends and conventions in the industry, over the road vehicles use 12 or 24 volt DC systems to power the starter motor and other electrical loads. For this reason our bus has a 12VDC electrical system. Because it's a living quarters it also needs standard 120VAC to power all the domestic appliances that are standard in a conventional home. Because the bus combines both house and vehicle its electrical system is hybrid. Almost all the lighting (including fluorescent) is 12VDC. The exception to this is the microwave's oven light. Heat exchanger and furnace blower motors are all 12VDC. The refrigerator uses 12VDC, 120VAC and propane. This appliance is unique in that regard. Onboard computer systems to include engine control, leveling systems, interior safety systems and monitoring are all 12VDC. There is over 3 miles of wire in this bus and its electrical systems are complex owing to the unique requirements of a home on wheels. 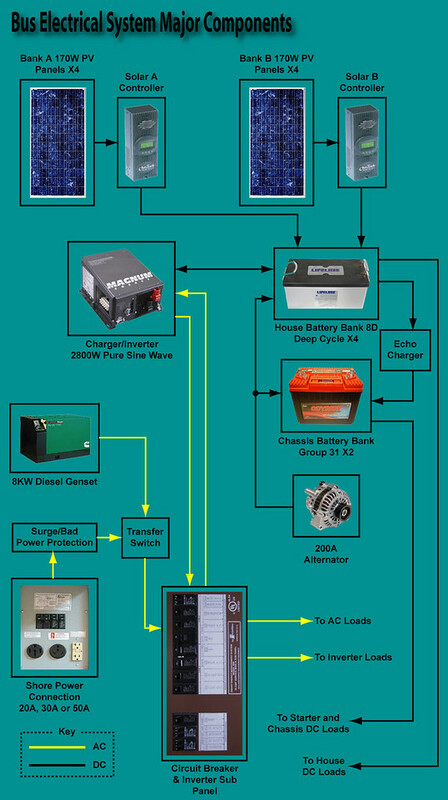 Both 12VDC and 120VAC systems work together as illustrated above to provide power to its hybrid components. The wiring has been done extremely well and all good quality components have been used. All wire is silicone jacketed high flex cable of appropriate gauge. Overall the electrical systems have performed well.